Tim Cook should be immensely proud of Apple’s stunning success, because the road to the one trillion dollar market cap hasn’t been easy. Tim has personally endured the slings and arrows from certain segments of the media and a few institutional investors for years. One critic claimed Tim was the wrong choice to sit on Apple’s board of directors, prior to his assuming his current role. Another claimed recently that Tim is Microsoft’s Steve Ballmer, and destined to fail. After troubles at the iPhone Foxconn manufacturing plant came to light in 2012, a Forbes opinion writer claimed that Tim Cook was to blame. 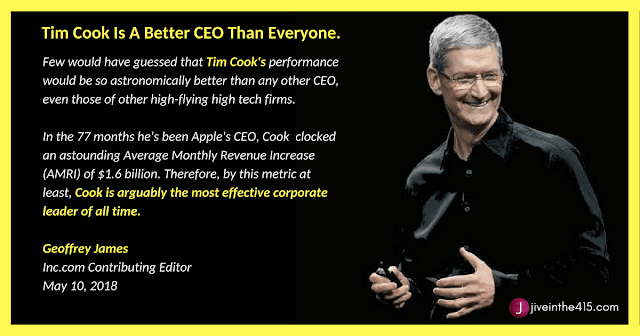 When he was anointed the new Apple Chief Executive Officer (CEO) and successor to Steve Jobs back in 2011, Wired magazine’s Tim Carmody answered Tim’s critics with a piece that explained why Tim was the RIGHT choice to succeed Jobs. Tim Cook credits his success to hard work and his humble roots. When he publicly came out in a 2014 essay written for Bloomberg Businessweek, Tim declared “I’m proud to be gay, and I consider being gay among the greatest gifts God has given me.” That’s a sentiment that many of us share with Tim. 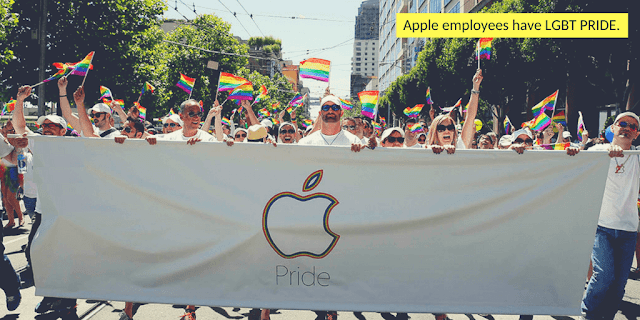 Tim Cook isn’t just Apple’s CEO, he’s a social justice advocate, an LGBT activist, and an environmentalist. His life and life experience influences the decisions he makes, and has an impact on the corporate social responsibility and values that Apple continues to embrace. In April 2018, Apple announced its global facilities are powered with 100 percent clean energy. After the release of Apple’s diversity report in November 2017, TechCrunch reported that Apple has a larger percentage of black and Hispanic employees, than any other technology company. We all travel different roads in our coming out process, and we learn that being gay bi or trans isn’t a ‘lifestyle choice’. We know It isn’t always easy to be out and self-identify as LGBT. What makes Tim’s success special is that everyone in the lesbian, gay, bisexual, transgender, and queer (LGBT) community can stand a little taller and celebrate in Tim’s success. “As I look at the world, many of the problems of the world come down to the lack of equality,” Cook said. “It became clear to me that there were lots of kids out there that were not being treated well, including in their own families, and that kids need someone to say, ‘Oh, they did okay in life, and they’re gay so it must not be a life sentence in some kind of way,’” Cook said. For Cook, surrendering his privacy was worth it, since it meant giving lots of people a role model to look up to. 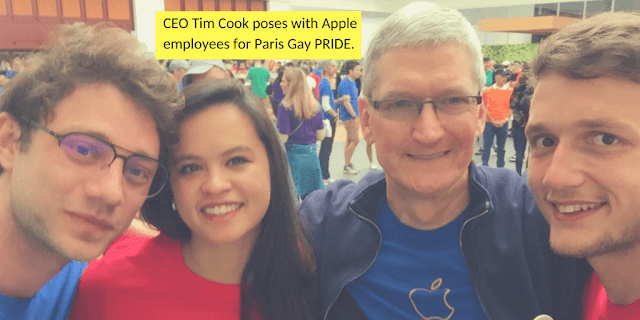 Tim is a great CEO, an effective social justice warrior, and a GREAT gay role model for LGBT kids and adults alike. He’s arguably the best CEO of all time. Ed. Note: This story was updated on August 11th, 2018 at 5:30AM PDT to add the Donald Trump dinner and Tweet.